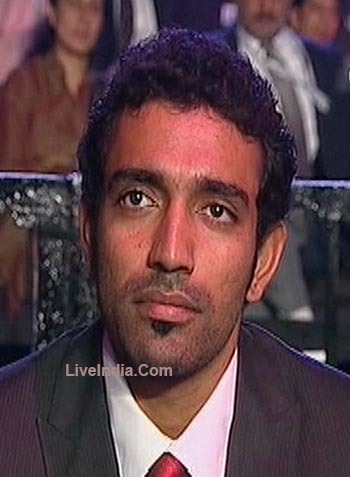 Aiyudda Robin Uthappa born 11 November 1985 in Kodagu, Karnataka) is an Indian cricketer. A son of an international hockey referee, he made his one-day international debut in the seventh and final match of the English tour of India in April 2006. He had a successful debut, making 86 as an opening batsman before being run out. It was the highest score for any Indian debutant in a limited overs match. Uthappa first came to the public's attention when he made 66 for India B against India A in the Challenger Trophy in 2005. The following year, in the same tournament, Uthappa made matchwinning 93-ball 100 against the same team which propelled him in the big league. Previously, he had been a member of the India under-19 team that won the Asia Cup. Once a wicketkeeper-batsman, his List A batting average of near 40 with a strike rate of approximately 90 has made him regarded as something of a limited overs cricket specialist. He was recalled to the ODI side in January 2007 for the series against the West Indies where he smashed a 70 from just 41 balls. He has been recently selected in the 15 member squad of the Indian Cricket team for the ICC Cricket World Cup 2007 to be held in West Indies in this March-April. Tall and robust Robin Uthappa, the son of Venu, an international hockey referee, scored heavily in the Ranji Trophy till he could not be kept out of the Indian one-day team any longer. Although his initial record in domestic cricket - a first-class average of 32 from 20 matches with just one hundred - was modest he plundered 854 runs in 7 Ranji matches in 2006-07 to top the batting charts. At one time a wicketkeeper-batsman, Uthappa has since given up the big gloves to concentrate on batting, and now occasionally bowls mediumpace. As a batsman he has always been attractive to watch, hard-hitting, with every shot in the book, unafraid to hit the ball in the air. A useful member of the India under-19 team that won the Asia Cup, Uthappa first caught the eye when he made a brilliant 66 in a losing cause for India B against India A in the Challenger Trophy in Mumbai in 2005 against an attack that included Zaheer Khan, Murali Kartik and RP Singh. But it was in the subsequent edition of the same tournament, in Mohali in 2006, where he cracked a matchwinning 93-ball 100 for India B against an India A team that had seen a ton from VVS Laxman, that Uthappa really arrived in the big league. It won him a place instead of Virender Sehwag in the final one-dayer against England early in 2006, and he capitalised with a well-paced 86 at Indore. His next two outings were less spectacular, but time is on his side. After a spell out of the team Uthappa got a chance in the sixth ODI against England at The Oval. A nerveless unbeaten 47 off only 33 balls helped India seal a rousing win, and, for the moment, his place in the Indian team.